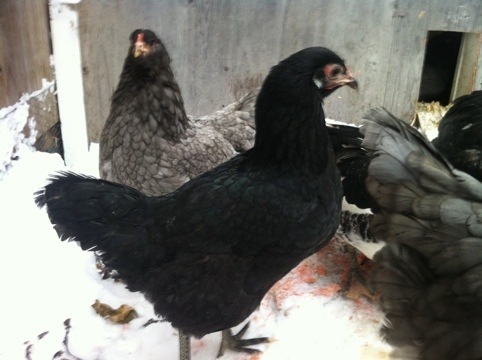 This entry was posted in Alaska Permaculture, local food, sustainable living. Bookmark the permalink. I forgot about the ducks! The day you called, Mike brought in 7 eggs! I think that was a day and a half, but still a record for the season. They are getting extra light via a 9 W CF and the days are getting so much longer that it takes weekly adjustment. Still light at 5 pm now! Love you dearly. Congrats on success with the chickens. Love to all. I like to turn all my light on early early in the AM, so they can have a natural going to bed time. There’s a fear that if the light just goes out when it’s really dark they may not be appropriately roosted. Of course you may have enough ambient city light that it’s not a problem. 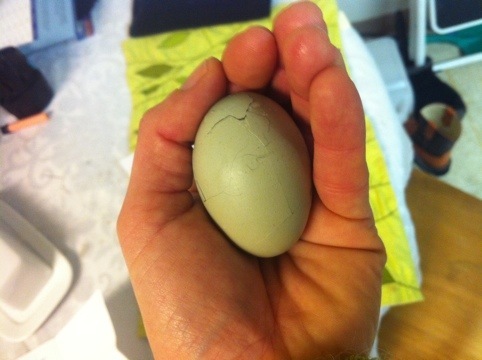 I’m thinking that the first egg I found was from the day before and that I have one grey easteregger that is laying one egg a day, though she skipped yesterday, she was on the nest today before I left for work. I think there is enough ambient light in my neighborhood to make the evening light shut off a non-issue. 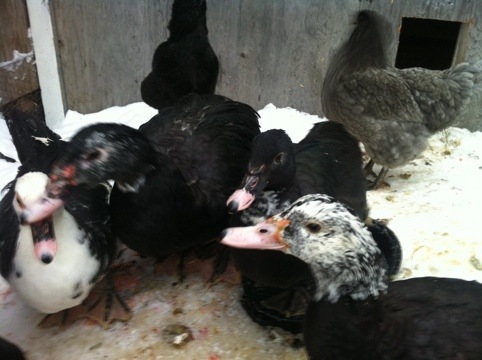 Start-up costs to date: ~$30 for 10 chicks, ~$70 for 3 adult ducks plus loan of proven mother duck, ~$60 in local grain and small bag of chick starter, ~$10 for spray foam for coop, ~$40 for chicken wire for coop/tractor, $24 7 watt led light bulb for coop. Free table scraps, salmon waste from dipnetting, lumber and insulation scraps for coop. Daily costs (worst case scenario – January – approx. highest supplemental light needs, plus high feed needs because of cold/snow): ~$0.01 per day for electricity for light, ~$0.40 per day for local grain. So if I average my fixed costs over a 3 year lifespan for the animals and 10 years for the coop itself, my worst case costs are about 58 cents/day. I know one shouldn’t count eggs before they are laid, but if I get a pretty conservative 2000 eggs in that three years (out of 5 hens and 2-3 female ducks), that works out to less than $3.81 a dozen. Not including the meat (three cornish-sized young chickens and a rooster butchered to date, hens in the stew pot when they stop laying?, fall-butchered muscovy duck offspring?) and fertilizer. This is all being quite conservative with my estimating, but counting on a good supply of free salmon scraps and table scraps/greens and assuming no accidental deaths, etc. The price per eggs would be much lower if the duck costs weren’t in there too, but I don’t feel like separating them out right now, I’ll just let eggs subsidize my muscovy meat operation for now! So glad to hear about the non-fishiness! I was going to ask you about it. 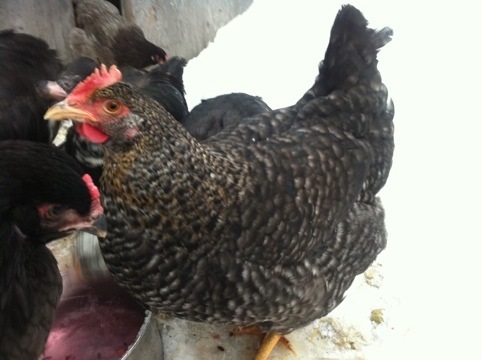 I’d heard that you could give fish scraps to chickens, but didn’t want to try it for exactly that reason (in Kansas, we never had a lot of opportunity to feed the chickens fish…). We did a light inside and Christmas lights on the coop (chickens like to be festive, too) and it’s worked out well since they hang out outside now when it’s dark. 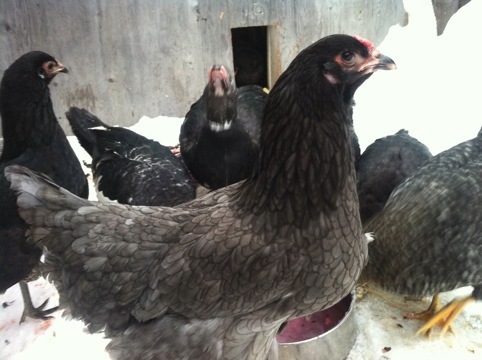 We got another chicken “donated” to us by a friend who had the rest of hers wiped out by a coyote, and she’s still not quite accepted by the others, but is laying, so no complaints! I like the idea of xmas lights on the coop! That would help convince them to get some fresh air.